I've seen this iconic round gold tin in many stores over the years. I had never heard of this brand of candy, so I never bothered to purchase it. Well, times have changed. ﻿ Now that I'm doing these reviews in my spare time, I'm always on the lookout for new and exciting candy to try. I saw this canister at Gordman's, a large discount retailer we have here in town. I wasn't excited about the wild berry flavor but I bought them anyway to add to my candy review stash. 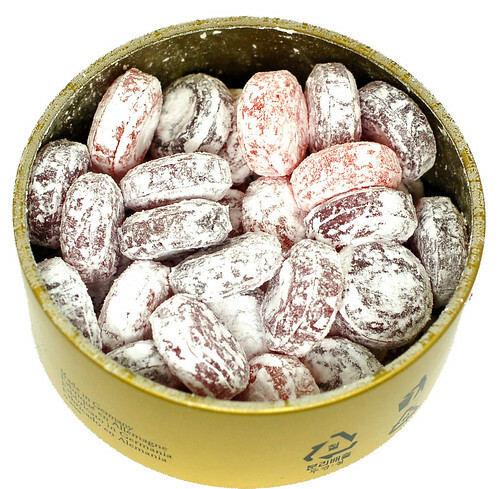 Cavendish and Harvey is a German company that has been making boiled sugar sweets since 1932. They have a very long list of flavors they make and you can find their hard candy in stamped shapes, discs and all kinds of assorted shapes. The round golden tin is a product signature for this company, but is not their only type of packaging used. Since I've purchased this tin, I've found several other flavors in various stores around town. They are very easy for me to spot, now that I know what I'm looking for. I love the photos of fruit that they put on the round golden tin lids. They are visually appealing and everything about this candy makes it feel upscale to me. However it also looks like something my Great Aunt Rose would keep at her house. It manages to look upscale and old lady-ish at the same time. Another signature of this brand of candy is the light coating on each candy which looks like powdered sugar. The flavor of this tin was "berry flavored" and it was hard for me to distinguish between flavors. I could only see two colors inside, a dark and light red. You can definitely taste some raspberry and blueberry, but then it all blends together to give you berry-like flavor. The candy is good and has a very nice crunch and taste. I'm not overwhelmed with the flavors of this tin, I wish I could have found the cola or citrus fruit ones. This isn't a candy that is easy to carry with you, and you might put this in a candy dish, but only if you wanted a giant candy blob that you could chip pieces out of later. These are best eaten at home where you can get out the tin, chip out a candy or two to eat and then put it away. These are much tastier than a Jolly Rancher or Lifesaver and far classier. So if you are a hard candy fan, give them a try...or pick up a tin for your Great Aunt Rose. Missed you! Hope you had a good break! Wait, "Cavandish and Harvey" is GERMAN? How funny, they choose a sort of "old brit" kind of name for their company. Is it corn starch on the candies to keep them from sticking together? But it seems they stick into the clumps, so maybe not. In any case, I love these tins, I realize I need some for my current boxes of "Halder" sugar-free candies that are spilling out into my backpack. 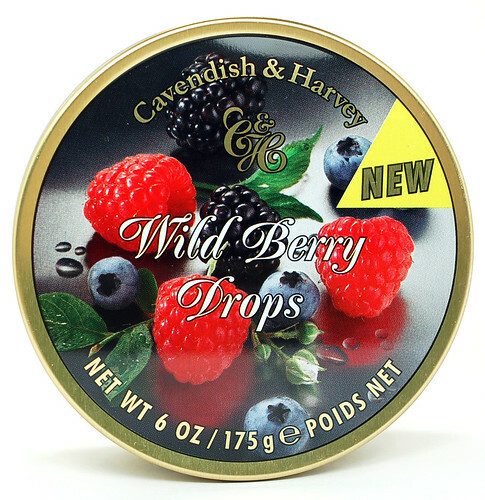 Please tell if Wild Berry Drops contain any animal’s products or not. What the meaning is of may contain traces of milk exactly? It’s very important for me because I’m vegan vegetarian.